A model of PES1 activity in breast cancer. PES1 promotes mammary tumor growth and plays a role in sensitivity to endocrine therapy by regulating the stability of ERs. PES1 reduces the interaction of ERα with the E3 ubiquitin ligase CHIP, thereby blocking ubiquitylation and degradation of ERα. 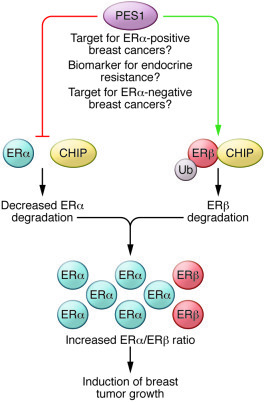 In contrast, by inducing the interaction of CHIP with ERβ, PES1 targets ERβ for degradation. This leads to an increase in the ERα/ERβ protein ratio that has been shown to influence breast tumor growth. Since ERα levels determine tamoxifen sensitivity in breast cancer, PES1 may have a role in predicting response to endocrine therapy. These findings also suggest that PES1 may represent a novel therapeutic target in breast cancer and may serve as a useful biomarker for endocrine therapy resistance. Ub, ubiquitin.